When I was a kid my parents used to let me stay up and watch Siskel and Ebert on television. This was back in the day when they were still on PBS and had yet to hit the big time. Their show gave me my first exposure to Louis Malle’s My Dinner with Andre (1981). In my mind, I seem to remember them giving this film, about two guys talking over dinner in a swanky restaurant, their much coveted two thumbs up. I never forgot the clips from the film that they showed and it was many years before I finally saw it. It seems rather fitting that a film about two artists having an intellectual discussion would get the deluxe DVD treatment from those classy folks at the Criterion Collection. 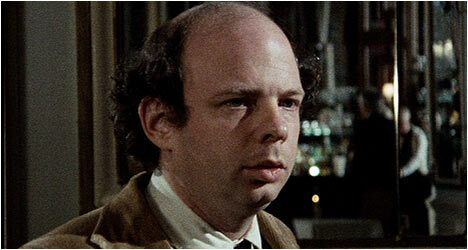 We first meet playwright and actor Wallace Shawn walking the run-down-looking streets of SoHo in New York City as he contemplates the difficulties of his profession. He is en route to having dinner with an old friend, which he is dreading because they haven’t spoken in years and he’s heard all sorts of rumours. Shawn arrives at the restaurant and finally meets his old friend who is none other than theatre director Andre Gregory. They get ordering their food out of the way and the film gets down to business: an in-depth conversation that covers all sorts of topics. Gregory starts things off by telling a long story about how, years ago, he had become disenchanted with the theatre and how his passion for it was rejuvenated. Other highlights include Gregory telling Shawn about what he always perceived as the fascist undertones in The Little Prince, an amusing story about a Buddhist monk who stayed with him and his family and how, over time, his habits changed due to the influence of metropolitan life. Gregory ruminates about death and the state of things – how we are unaware of ourselves. Conversely, Shawn talks about expressing one’s feelings directly and champions the theatre. He also talks about the notion of reality. Most people know Shawn from either The Princess Bride (1987) or Clueless (1995), his two most high profile films, but prior to them he had several plays produced off-Broadway, including Our Late Night in 1975, which was directed by Gregory. Soon after, he had a memorable cameo playing Diane Keaton’s ex-husband in Woody Allen’s Manhattan (1979). Like Shawn, Gregory was a well-known figure in New York’s experimental theatre world. He founded the Manhattan Project in the late 1960s, a theatre group that was known for its lengthy rehearsal periods and extensive use of improvisation. My Dinner with Andre is a film that champions the lost art of conversation – something that is even more apparent in a world dominated by technological distractions like cell phones, the Internet, iPods, and so on. These things weren’t around at the time of the film which dates it, but in a good way. This is certainly not a film for everyone as many would probably find a film about two guys pontificating and philosophizing a big bore but for those who believe that we are getting increasingly disconnected from each other will find comfort in My Dinner with Andre. “Andre Gregory and Wallace Shawn” features filmmaker Noah Baumbach interviewing the stars of My Dinner with Andre separately. Gregory talks about how he met Shawn and how the film came together. He had told many of the stories recounted in the film, socially, and often felt like he was rehearsing for a film. He says that they asked Mike Nichols to direct but he couldn’t do it. Gregory talks about the writing and tells a lot of fantastic stories. Shawn talks about his views of theatre and his early experiences as a playwright. He also talks about how he came up with the idea for the film. One of his goals for the film was to destroy a side of himself that was ruled by fear. He says that Louis Malle brought a warmth to the film that he hadn’t written and may explain why it was so well-received. “My Dinner with Louis” is a 1982 episode of the BBC show Arena and features Shawn talking with filmmaker Louis Malle about working with Jacques Cousteau and making films in America. He talks about the controversial reaction to his film, The Lovers (1958). He speaks quite eloquently about his early career. He discusses some of the themes he explored in his American films.